Durham, NC -- Vince Gill and his A-team acoustic band will rock the stage with a bluegrass show, Sunday, June 24 at Durham Performing Arts Center in Durham, NC. A 20-time Grammy-winner and member of the Country Music Hall of Fame, Gill will be backed by a band made up of some of the most acclaimed pickers in contemporary music, specifically fiddler Stuart Duncan, guitarist Jeff White, banjoist Jim Mills and bassist Dennis Crouch. Gill will round out the band on guitar, mandolin and vocals. 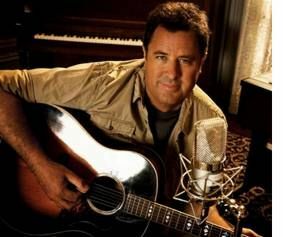 Nashville, TN – May 3, 2012 -- Vince Gill will take to the road for a dozen bluegrass shows in June. The 20-time Grammy-winner and member of the Country Music Hall of Fame will be backed by a band made up of some of the most acclaimed pickers in contemporary music, specifically fiddler Stuart Duncan, guitarist Jeff White, banjoist Jim Mills and bassist Dennis Crouch. Gill will round out the band on guitar, mandolin and vocals.